東京油組総本店在台北市敦化商圈開了第一家海外分店, 賣的不是湯麵, 也不是沾麵, 而是跟國泰醫院附近的ABURASOBA SHIN 油そば専門店一樣是賣無湯的醬汁拌麵. 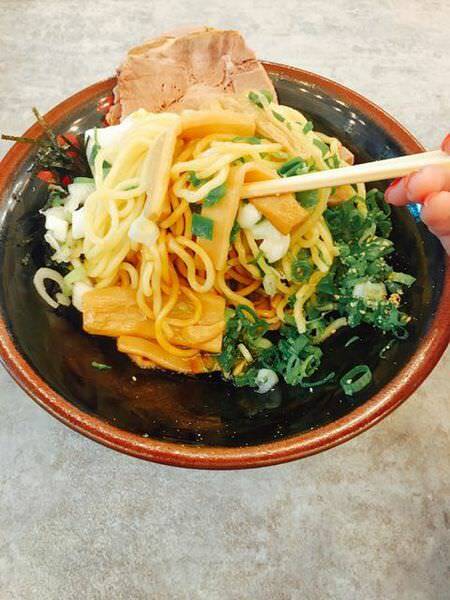 Abura Soba’s (油そば) English translation would be “Oil Noodles”. 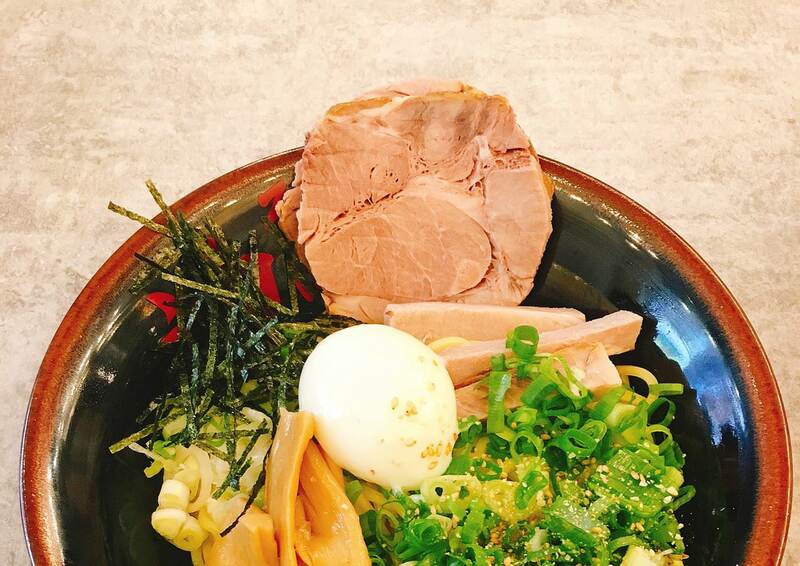 The ramen dish in Abura Soba Tokyo is ramen without soup nor dip sauce. It is originated from the Kitatama district of Tokyo in the early 1950s. It now opens its first oversea branch at Taipei East District. 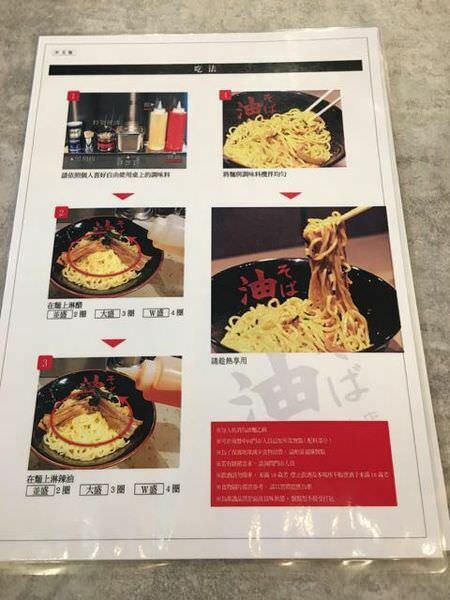 It is selling the same item – dry noodle with sauce, which is similar with ABURASOBA SHIN near Xinyi Anhe MRT Station. The store has one-person seat and also 2-people and 4-people seats. However, door and door are way too closed together. 菜單基本上只有兩種醬汁的乾拌油麵 – 招牌醬油油麵和辣味噌油麵, 有三種size (160g, 240g, 360g) , 我是點並盛 (160g), 醬汁有足夠 , 但是我不確定若是點其他size, 醬汁會不會變多.B 組合 (+90) 比A組合 (+$55) 多了兩片叉燒, 建議點Set B 即可. 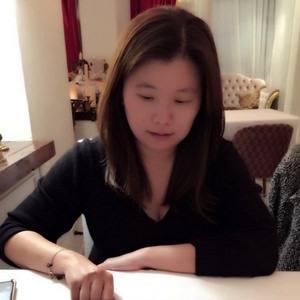 桌上有放白醋和辣油讓客人挑選 , 也有放胡椒跟切塊洋蔥增加風味. 入座後, 服務生很親切地介紹麵和麵配料組合, 當端上桌後, 他們也會解釋如何加白醋&辣油和理想份量. 放在碗底的醬油不是膏狀, 但是醬油香味卻是濃厚, 微重的青蔥味並無把醬油香味蓋過, 半熟蛋的蛋黃則是讓油麵變得更滑順且順口, 幾乎每桌的顧客都會發出在像是吃拉麵的聲音. 我則是另外免費加點一碗清湯. Two kinds of ramen on the menu – one is soy sauce, and the other one is spicy miso. Please note that both dishes didn’t come with the egg, less BBQ pork, and less green onion. 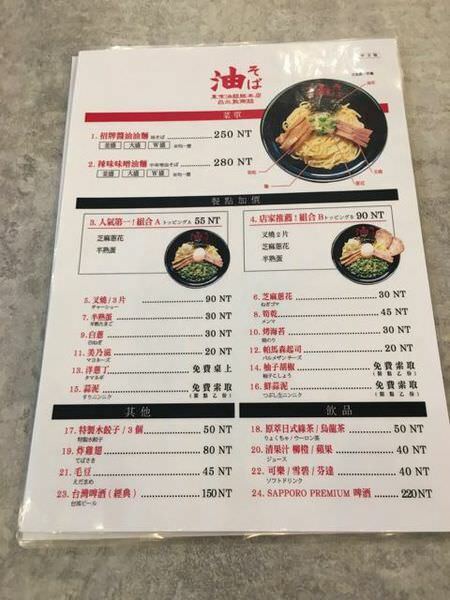 Three sizes of ramen qty – Medium (160g), Large (240g), and Extra Large (360g). All three are the same price.First, the waitress would explain patiently about their dishes and combination sets. When they serve the dish, they would recommend to add both vinegar and hot oil on the top of the ramen evenly. Even though the soy sauce is not in thick form but you can immediately smell the thick mild sweet soy sauce aroma after stirring the ramen evenly. Strong green onion flavor doesn’t not cover the soy sauce’s flavor. With the egg yolk, the ramen becomes moist and surprisedly smoothly. Almost everyone makes sounds while slurping the ramen. I also ordered extra plain soup for free as well. 每道菜都會有一些缺點, 例如叉燒並無再加熱而是冷的, 也無所謂的”肉味“. 價格的部份偏高是不可避免的, 因為原料幾乎都從日本空運, 號稱原汁原味販售. 若取美味跟價格的平衡點, 其實這家是算昂貴, 我不會建議這家拉麵店. Of course every dish has its flaws. The BBQ porks are not warm. Those are cold and has plain flavor without any meaty aroma. Also, the price is not price-friendly in Taiwanese Ramen market even though the sauce sachets and noodles are air-shipped from Japan. I wouldn’t recommend this restaurant because it is too pricy for most people.